• Consumers must carry heavy bottles or sign up for costly deliveries. • High cost: a family of four may spend $100 or more per month. • Hidden risks of water contamination (exposing bottles to sun may cause UV-accelerated leakage of chemicals in the plastic and water dispensers require regular sanitizing). • As much as eight to 14 liters (2.1 to 3.6 gallons) of pre-filtered water may go to drainage while collecting only one liter (0.3 gallons) of pure water. • A water storage tank, partially filled with air, is very large and can be difficult to fit in small kitchens. • Prefiltration cartridges in many instances (especially in developing countries) need to be frequently changed because of poor tap-water quality and large volumes of prefiltered water, where most of it is discarded into the drain. • Dependable, on-demand, high-flow RO required large prefilter cartridges. • There was a high salt content in the first few hundred milliliters of pure water because of salt concentration equilibrium between the retentate and the permeate sides of the RO membrane cartridge, given a few hours between filtration cycles. • Increased cost of domestic water to the homeowner, which was a major factor in low residential sales. More than 10 years ago, a water-on-water RO system was introduced in the US and was declared Consumer Report’s number-one choice a few years later. So called water-on-water systems were comprised of a pure water collection tank, where water was collected and stored at atmospheric pressure (see Figure 1). When the pure-water faucet was opened, a valve allowed the tap water pressure to be applied through the flexible diaphragm, pushing pure water out. It did not create back pressure during water collection and the tank could be completely filled with pure water. • Water recovery is improved, but still a large amount of drain water is generated. • They were not certified as microbiological purifiers. • The automatic valving system needs to be exceptionally precise to switch on and off in a domino fashion. It makes the water-on-water RO systems manufacturing process more difficult, limiting the number of competitors. • Tap pressure must be more than 1.5 bar to 2 bar (22.5 to 30 psi) in order for the domino-type consecutive series of valves to operate properly. 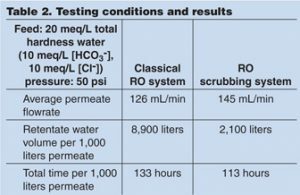 Another problem that concerns all home RO water purifiers is that the RO membrane cartridge is shipped dry, almost universally. NSF-certified RO membrane manufacturers require a 24-hour water wash before use. Unless water filter dealers wash it before installation, the task falls to the consumer. 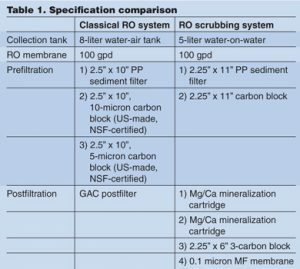 • Two prefiltration cartridges (5-micron 2.2-inch OD, 10-inch sediment filter and a composite 2.2-inch OD, 10-inch carbon/chelating fiber block CCFB). CCFB carbon blocks are made from powdered activated carbon, polymeric binder and chelating, hydrophilic ion-exchange fibers. Hydrophilic fibers (10- to 20-micron diameter fibers with the complex forming carboxylic and amine groups) are manufactured in Ivanovo, Russia. 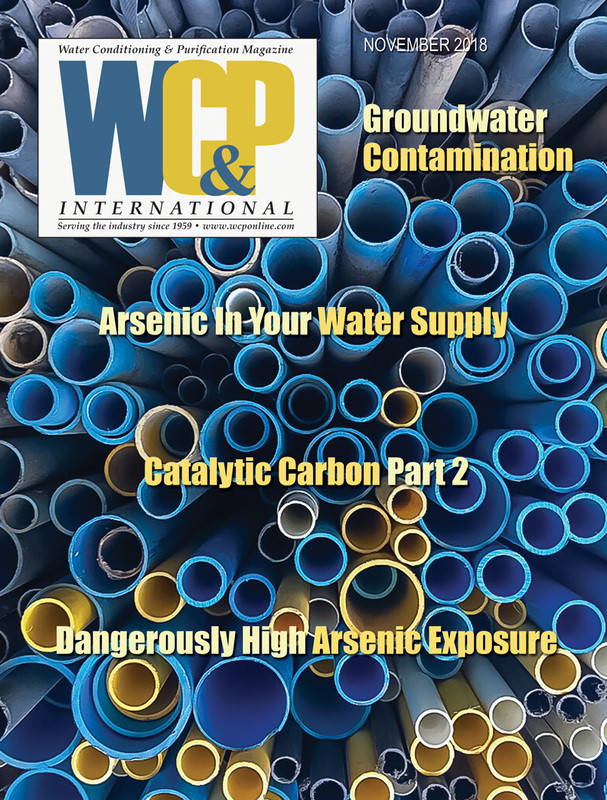 Chelating ion-exchange groups provide additional selective adsorption capacity toward heavy metals and large dirt-holding ability. Hydrophilic, capillary fibers lower pressure drop across the cartridge two- to three-fold as compared to the standard carbon block comprising only powdered particles while filtering solids. 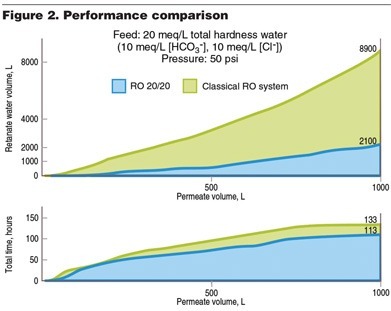 • Resulting water mineralization in the cycling water-on-water RO was measured to be between 0.4 to 0.7 meq/L combined calcium and magnesium, with the maximum measured when the RO permeate was stored in the tank for 72 hours and the minimum was measured when the permeate tank was completely emptied and the permeate water flowed directly through the mineralizers out from the drinking water faucet. 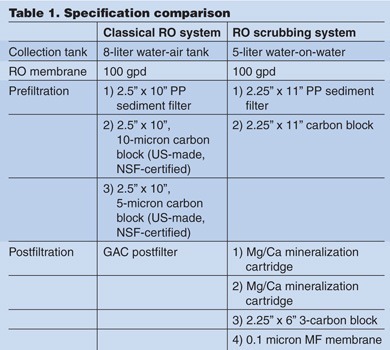 • Postfiltration with the 1.25-inch OD, 3-inch activated carbon block (and a 0.1-micron, 0.75-square-meter, hollow-fiber membrane cartridge) immediately before the pure water outlet (a hollow-fiber membrane cartridge from a a Japanese manufacturer, certified by the Japanese Health & Food Authority to remove at least 99.9999 percent of bacteria). The system underwent three months of continuous capacity testing, according to the US EPA microbiological purifier testing protocol at 0, 25, 50, 75 and 100 percent of stated capacity with bacterial and viral testing. • A built-in electronic controller keeps track based on how long the diaphragm pump has been in operation to determine when cartridges need to be changed. LED light indicators are located opposite each filter cartridge. The alarm gives a signal for the user to service the under-the-counter system. LED lights show which cartridge(s) must be changed. The reset button in the controller is used to reset the system after each cartridge change. After the tank was completely filled, the diaphragm miniature electrical pump automatically switched off. The time of filling the tank with the amount of water pumped into the drainage was recorded. 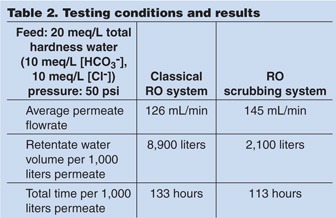 The test continued until 1,000 liters of permeate was collected. 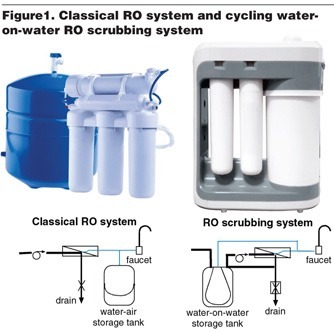 The disadvantages of this cycling water-on-water RO system are that it requires a 24V electrical power supply and with the built-in miniature diaphragm water pump, valves, electronic controller and hollow-fiber membrane postfilter, the system is more complicated than the simple, mechanically controlled RO systems. Water-on-water RO with cycling electrical pump-driven concentrate recirculation and the permeate collection tank completely filled with RO purified water and valve opening burst-type concentrate discharge were tested to have high permeate water recovery. 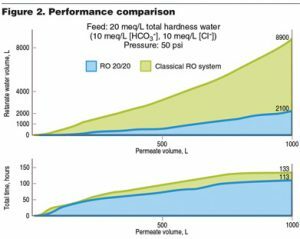 With rapidly improving electronic technologies and cheaper, higher flowrate, lower pressure resistance RO membranes, combined with the plunging costs and sizes of the controller, the electric pump and other electrically driven components are expected to accelerate advances and competition in home RO water purification. 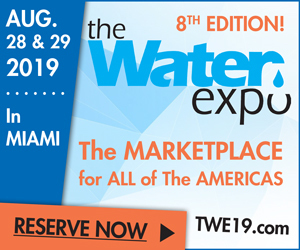 Water-on-water drinking water RO systems, invented more than 40 years ago, are expected to benefit from these advances. 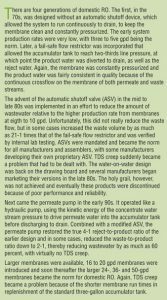 (2) Polyakov, Alexander and Shmidt, Joseph L. “A Comparison of Water-on-Water and Standard RO Home Filters”, WC&P International, October, 2011. Alexander Polyakov is Vice President, Technical Sales of Westaqua/Aquaphor Corp. and a graduate of the Leningrad State University Physical Chemistry Department’s PhD program. Email him at alexander.polyakov@aquaphor.com. 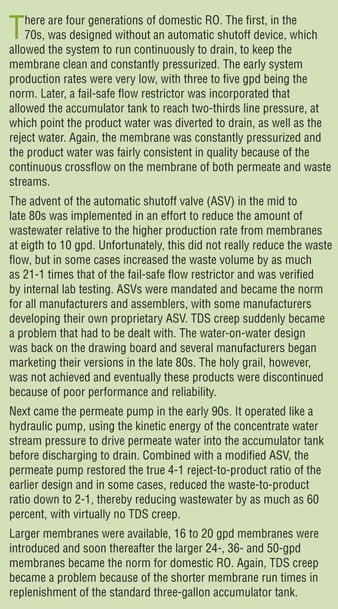 Joseph L. Shmidt, CEO of Westaqua/Aquaphor Corp., was co-Founder of Membrex, Inc. (now a part of Osmonics, GE Water). He earned his PhD and MS Degrees in chemical engineering from Columbia University, NYC. Email him at joseph.shmidt@aquaphor.com. WestAqua/Aquaphor Corp., Estonia (a subsidiary of Electrophor Inc., New York, US) was founded in 2007. 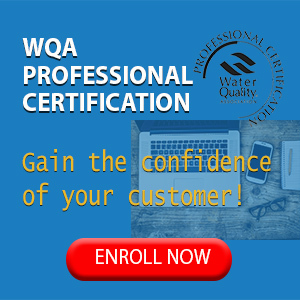 WestAqua manufacturing is supported by the R&D department of Aquaphor Corp., its sister company in Russia (founded in 1992). Aquaphor R&D department employs more than 100 chemists, engineers and microbiologists who design and develop different water filtration POU and POE water treatment systems and filtration materials. 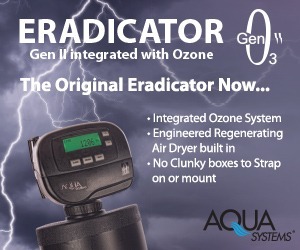 Visit www.aquaphor.com.